Sony - Music monster! With bite marked brochure. Stolichnaya Vodka ornate enamel lapel badge and mini guide to Russian cultural icons. Wii wrist band! EVO magazine Trump cards! Original Source Mint and Tea Tree Shower Gel. Virgin Atlantic Calendar. Nissan… looks like crayons, but they are soap! Sony Bravia PLAY-DOH! Jordans Cereal and Penguin Books team up for cereal poetry. 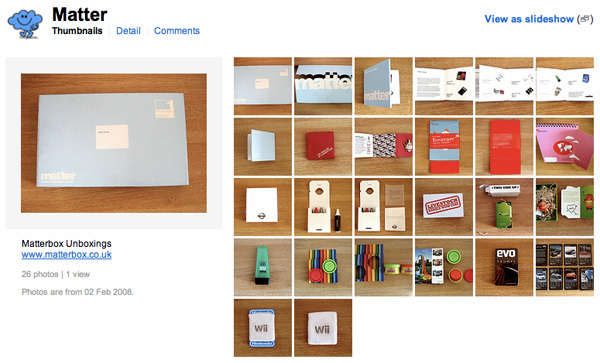 Adam Crowe’s Flickr Set on the unboxing is a good one to check out. 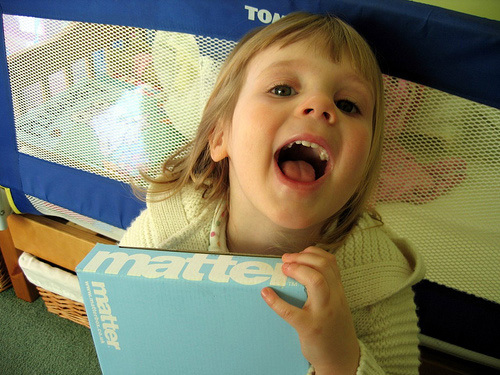 And there are even more flickr pics tagged ‘matterbox’, but this one of Grace from Dalelane pretty much says it all… see Dale’s unboxing/review here. I signed up for one box, but Im from Argentina…can i recibe the matter box? I hope so cos its amazing! bye! I signed up for one! Excited! Just another thing… in the video when he was talking about the contents I thought he said there was some Vodka in there… but no. Just letting you know. 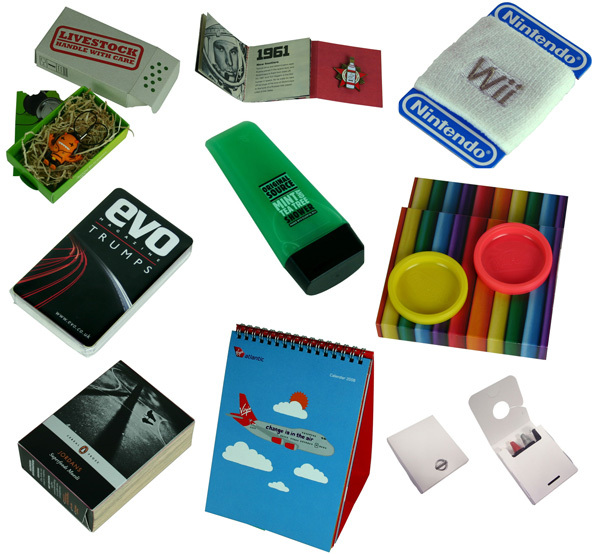 The matter box is an awesome idea! Accept, I don’t really get the Soap concept from Nissan. On the Matter Box website it said that the concept was to show people that Nissan isn’t what you expect. Yeah, accept you wash your hands of it. Great idea all in all, though. Nice job Matter. Thanks for linking to my video, hope people liked it. To answer the other commenters, I don’t think the Matter Box is available outside the UK, no - but then I’m not involved with creating it so maybe if there’s enough interest, they might do something about it, who knows? 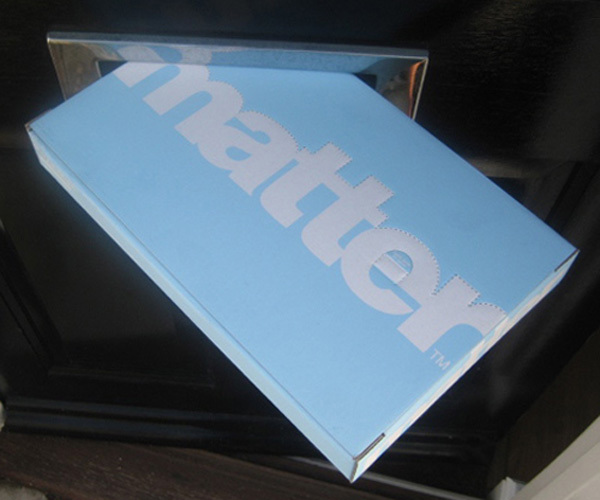 But, can residents in the United States receive the matter box? How can I join their mailing list? 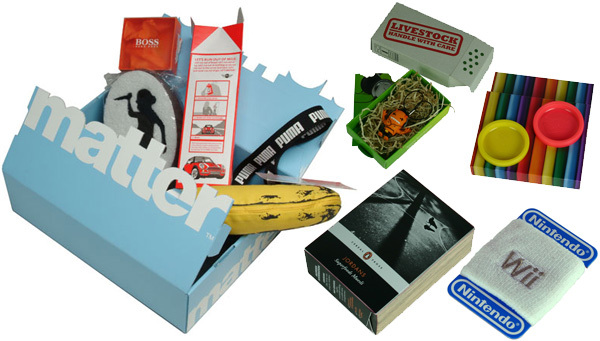 I’ve joined the mailing list, can’t wait for my first box! Um, isn’t this just a corporate version of The Sampler (homeofthesampler.com)? can citizens of the US get one? I think the Matter campaign is something that should really stick. Print advertising has reached about its design limit in creativity. With many ideas just being reproductions of the old. This is daring, more personal able, and much much more cool.